MV Solomon Trader ran aground during high winds on February 5 while loading bauxite at remote Rennell Island. 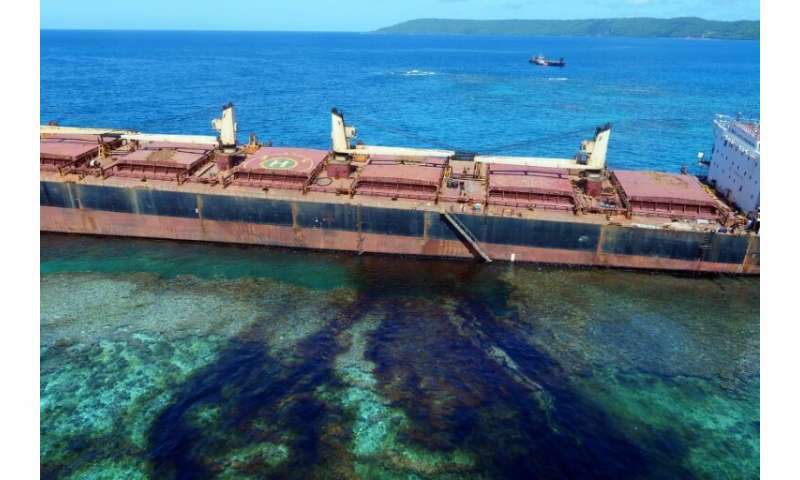 More than a month later, the 225-metre (740-foot) ship is still stuck on the reef and has leaked more than 70 tonnes of heavy fuel oil into the sea, with another 600 tonnes still on the stricken vessel. "We needed much speedier action in response to what is potentially a very significant natural disaster," Australia's minister for international development and the Pacific, Anne Ruston, told AFP Friday. "We would have liked to have seen that the operator and their necessary insurers were a little bit quicker to respond to what was happening, instead of leaving it up to Australia and the Solomon Islands to respond." The ship's insurer, Korean Protection and Indemnity Club (KP&I), issued an apology late Wednesday on behalf of itself and the vessel's Hong Kong-based owner, King Trader Ltd. Addressing delays in responding to the disaster, KP&I said a tug initially tried to manoeuvre the ship off the reef but poor weather intervened and pushed it further onshore. Rennell Island is the largest raised coral atoll in the world and includes a UNESCO World Heritage site which extends kilometres out to sea. The islanders rely on waters in the ecologically delicate region for their livelihoods. Experts and specialised equipment are now on site from as far afield as Australia, New Zealand, Vanuatu, the United States, Singapore and Europe. They are cleaning up the shore and removing the remaining oil from the ship, while divers were to inspect the hull and seal any leaks. The Australian government has sent salvage experts to assist the response and vowed to help the Solomons make sure those responsible for the spill are held to account.